Corporate stakeholder relations are historically typified by power imbalances and mistrust, but in recent times, they are increasingly characterized by 'dialogue' based on mutual understanding and creative action. 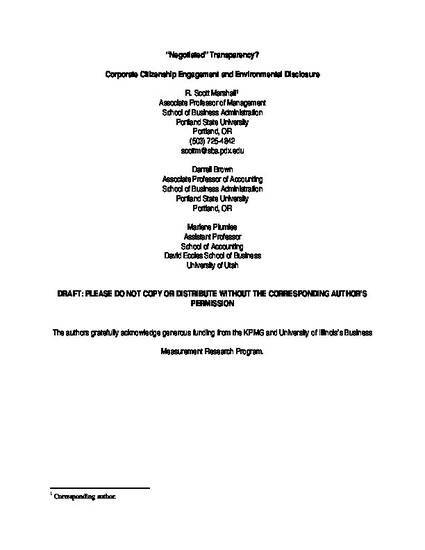 In this paper we consider corporate engagements with two external stakeholder groups, citizenship-focused non-governmental organizations (NGO) and institutional investors, and examine the potential association between these engagements and corporate disclosure of environmental information. Based on a sample of 183 firms over a three-year time period, we analyze the relationships between NGO engagement, investor activism and the quality of corporate voluntary environmental disclosure. Our findings suggest that engagement with skills-focused NGOs and the withdrawal of shareholder resolutions, as mechanisms for dialogue and negotiation, are strongly related to higher quality disclosure. We conclude with discussion of our findings in terms of modern governance structures influencing transparency in the corporate sector as well as comment on how corporate citizenship may, indeed, be making a difference. Marshall, R. Scott; Darrell Brown,; Marlene Plumlee,. 'Negotiated' Transparency? Corporate Citizenship Engagement and Environmental Disclosure*." The Journal of Corporate Citizenship. Greenleaf Publishing. 2007. Marshall, R. Scott; Darrell Brown,; Marlene Plumlee,. "'Negotiated' Transparency? Corporate Citizenship Engagement and Environmental Disclosure*." The Journal of Corporate Citizenship. Greenleaf Publishing. 2007.